I am back from Costume College, and all unpacked! 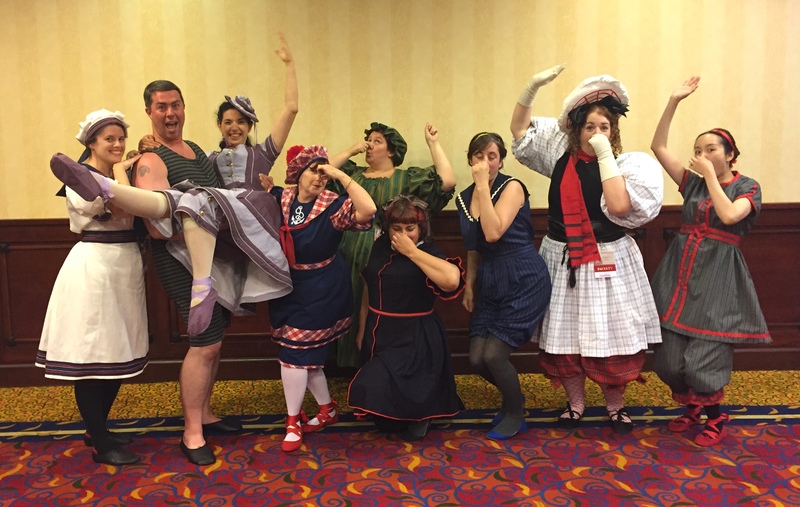 There were so many wonderful things that I will have to make multiple posts to summarize the whole event. 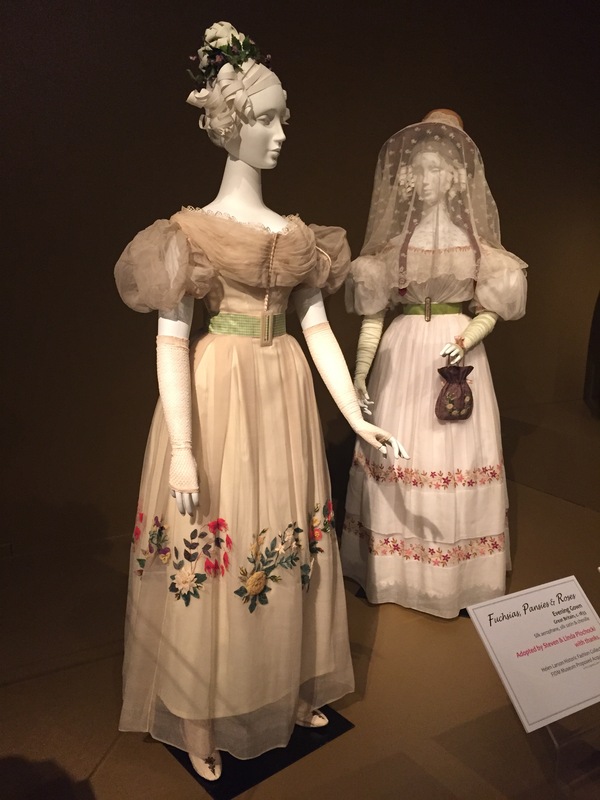 We drove down Thursday morning, and 4 of us met up partway down for lunch, and then again at FIDM to check out their costume exhibit. 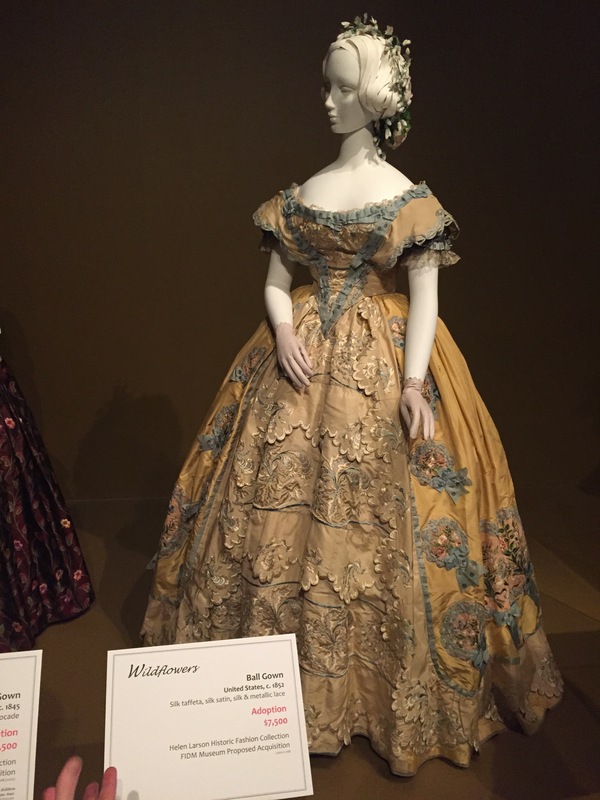 There were a lot of outfits from Emmy-nominated shows (most of which I had never seen), but what we were there to really see were the historical gowns on exhibit. Here are a few of my favorites. Check-in at the hotel was an adventure, since their computer system decided to go down on one of their busiest days of the year! Luckily, we did not have to wait too long for our room, although some people who got there earlier had to wait more than 2 hours. 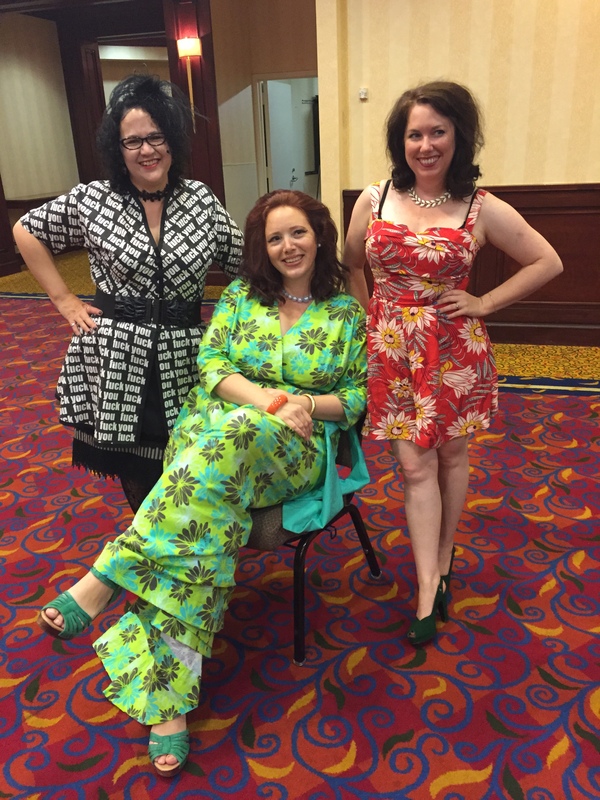 Right before the annual pool party there was a special taping of the Frock Flicks podcast, hosted by Kendra, Sarah, and Trystan. It was a lot of fun. 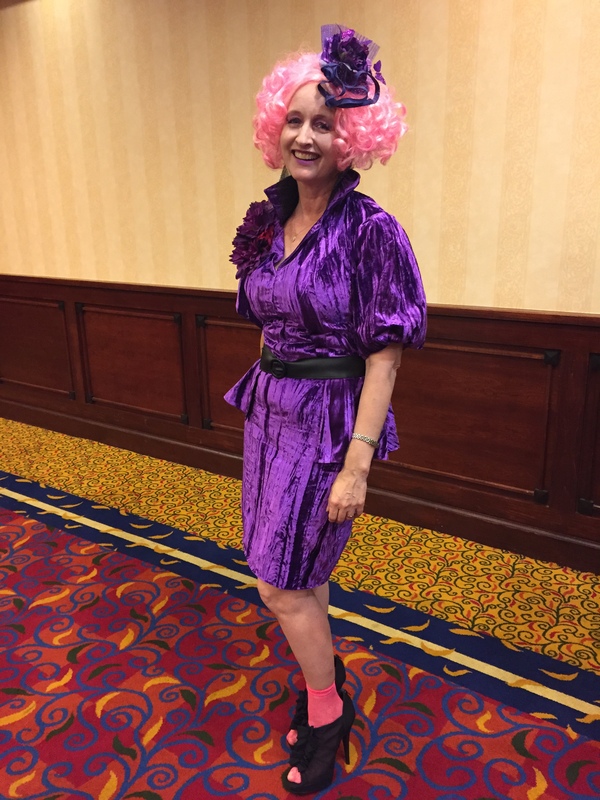 Effie Trinket (of the Costumer’s Closet) also showed up. Our Bevy of Bathing Beauties group assembled at the podcast before going down to the pool. 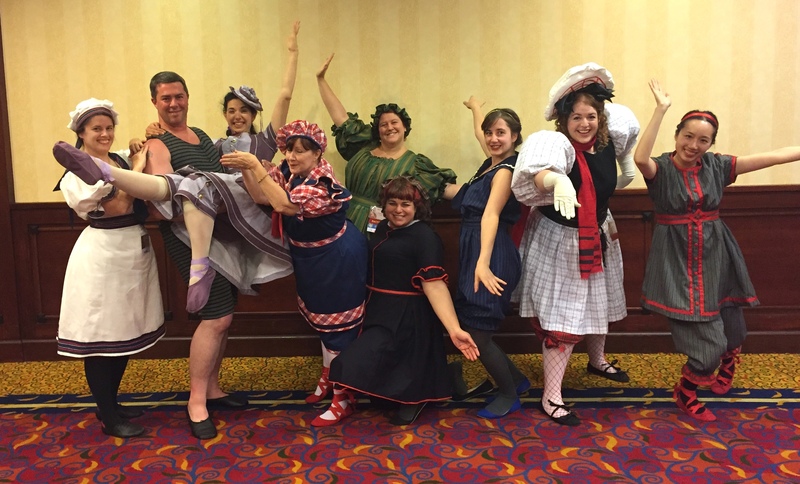 We made Victorian bathing suits and took some silly photos! Maybe next year we’ll have more than one Bathing Dude. More details about my outfit were posted previously. 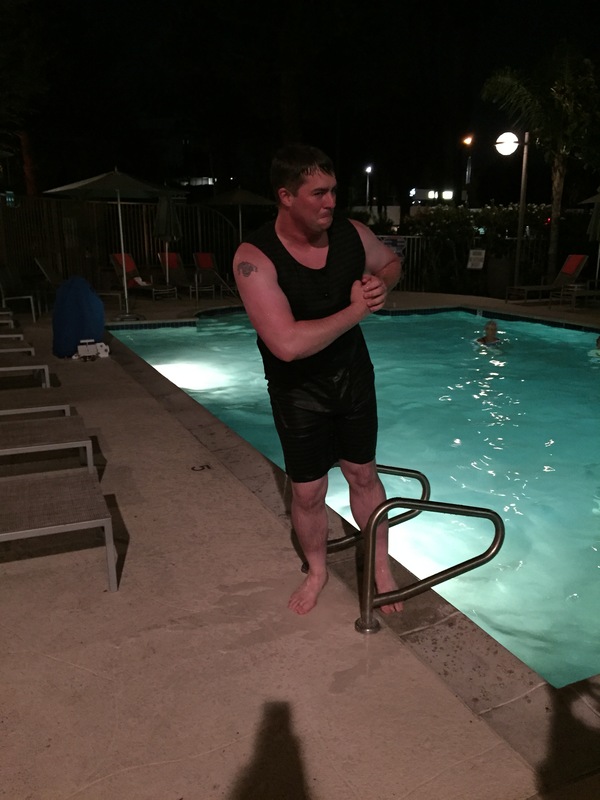 Curtis was the only one brave enough to go into the pool. Some of us feared drowning. Stay tuned for Friday! 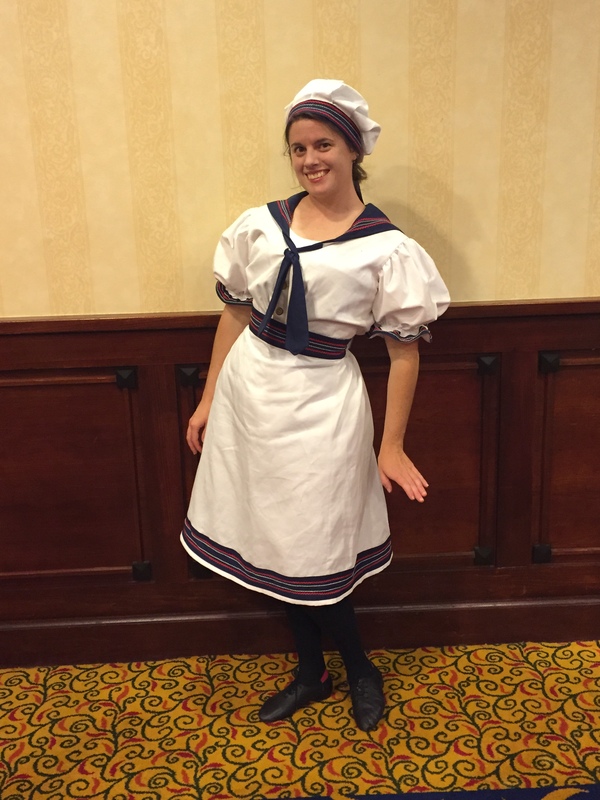 Posted in Costume College 2015, Victorian and tagged bathing suit, Costume College 2015, Victorian. Bookmark the permalink. 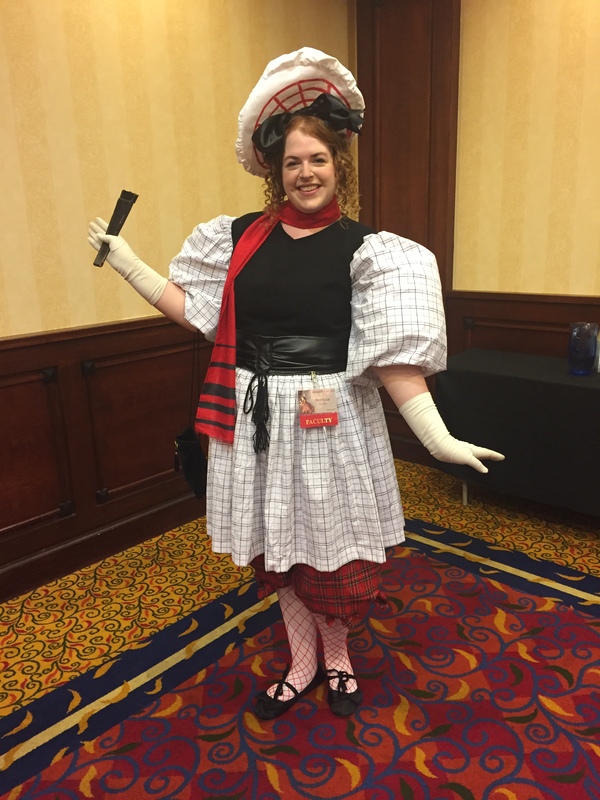 Costume College is just days away! Yesterday I finished my Victorian bathing suit for the Thursday night pool party. I was inspired by this bathing suit from the Met Museum. I made mine out of a gray and black wool/polyester blend. I didn’t have time to order red petersham, so I used grosgrain ribbon for the trim. 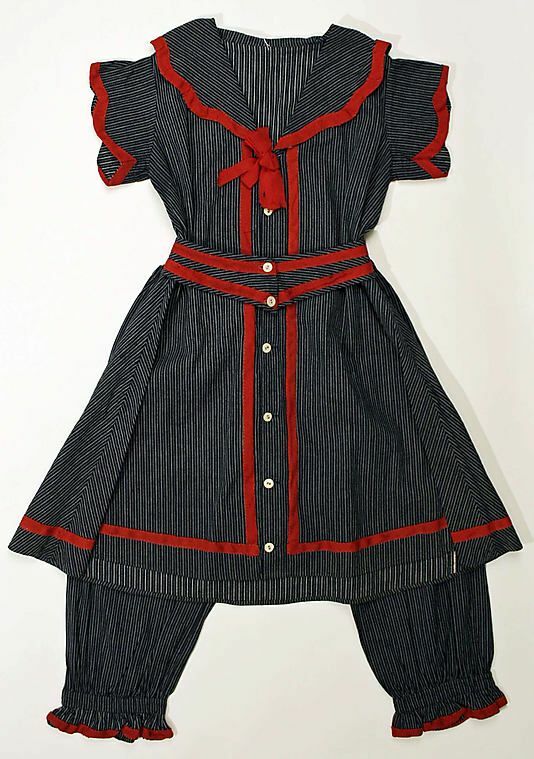 It looks nice on straight lines, but doesn’t curve as well as I would have liked for the collar and sleeves. 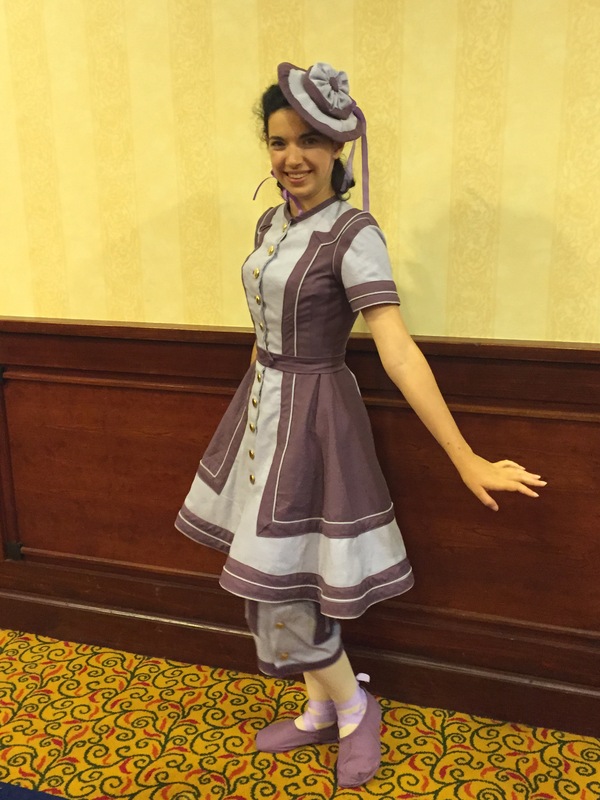 Here are a few quick photos of the outfit! Oops, I didn’t notice I put my belt on off-center. 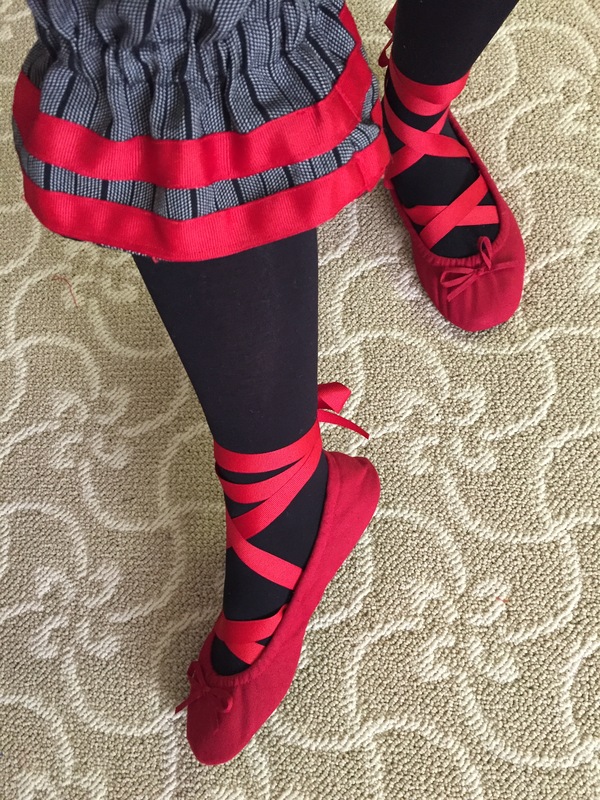 I didn’t have time to make bathing shoes, so I bought some cheap $6 flats from Amazon and used up the rest of the ribbon I had left. This photo looks like it was taken by someone else, but really I leaned over, then turned it upside down! 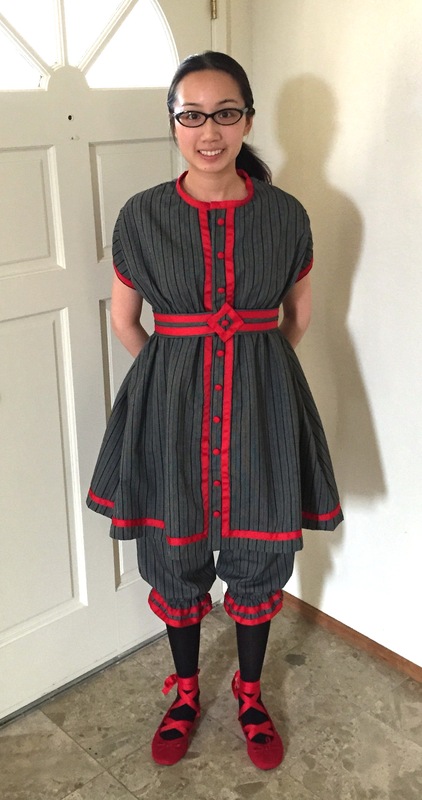 I used Ageless Patterns #1410 to make the dress and bloomers. The pattern isn’t awful, but I can’t really recommend it. Ageless Patterns are traced from extant patterns and magazines of the period, which makes them historically accurate, but lacking in directions and specifics about size. This pattern was simply listed as “medium.” (I think it fits more like a large). The arm holes are also strangely big, the shoulders are rather low, the sleeves didn’t quite fit right, and the collar piece was completely useless. It was a bizarre shape and didn’t fit. I eventually gave up and just bound the neckline. 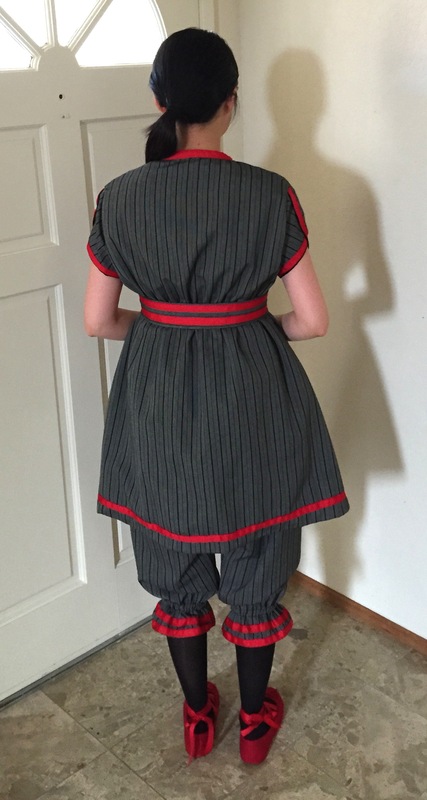 The good thing about the pattern, aside from the sleeves and collar, is that it is ridiculously easy to put together. The dress consists of one back piece and 2 front pieces, and you gather at the waist. 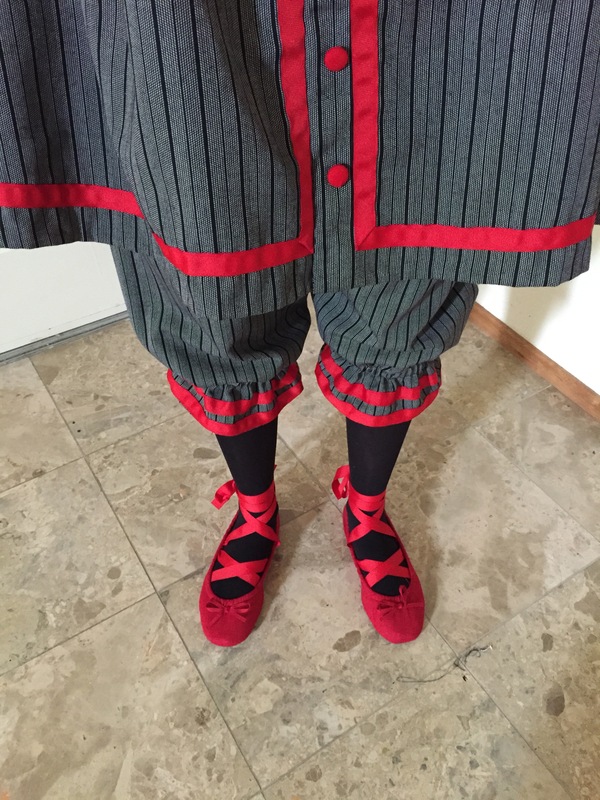 The bloomers consist of a front and back for each leg. Since the pattern was large on me I was able to cheat on the closures. I put an elastic channel into the waist, which is covered by the belt. 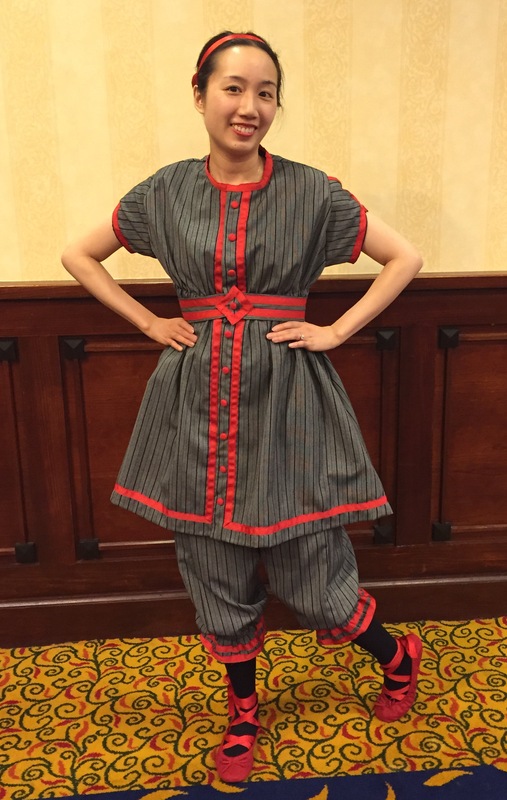 The dress from the waist down is sewn shut, and the top half closes with hooks and eyes. The buttons are false! No making buttonholes! I just pull this dress over my head, put the belt on, and then hook up the top. Super easy, and comfortable, too! (Edit: Post updated! I forgot to add in the price of the pattern).